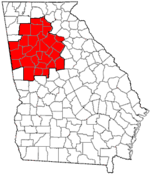 Hall County is a county located in the north central portion of the U.S. state of Georgia. As of the 2010 census, the population was 179,684. The county seat is Gainesville. According to the U.S. Census Bureau, the county has a total area of 429 square miles (1,110 km2), of which 393 square miles (1,020 km2) is land and 37 square miles (96 km2) (8.5%) is water. Slightly more than half of Hall County, the eastern portion of the county, is located in the Upper Oconee River sub-basin of the Altamaha River basin, while the western half of the county is located in the Upper Chattahoochee River sub-basin of the ACF River Basin (Apalachicola-Chattahoochee-Flint River Basin). The Gainesville AMTRAK station is situated at 116 Industrial Boulevard. Amtrak's Crescent train connects Gainesville with the cities of New York City, Philadelphia, Baltimore, Washington, Greensboro, Charlotte, Atlanta, Birmingham and New Orleans. Hall County remains extremely rural and many of its residents reside in unincorporated areas, accounting for more than half of the county's population. At the 2000 census, 139,277 people, 80,381 households and 80,009 families resided in the county. The population density was 354 per square mile (137/km²). There were 51,046 housing units at an average density of 130 per square mile (50/km²). The racial makeup of the county was 80.75% White, 7.27% Black or African American, 0.34% Native American, 1.35% Asian, 0.17% Pacific Islander, 8.75% from other races, and 1.36% from two or more races. About 19.56% of the population were Hispanic or Latino of any race. Of the 80,381 households, 37.10% had children under the age of 18 living with them, 60.20% were married couples living together, 10.80% had a female householder with no husband present, and 24.00% were not families. About 19.20% of all households were made up of individuals and 6.70% had someone living alone who was 65 years of age or older. The average household size was 2.89 and the average family size was 3.26. Age distribution was 26.90% under the age of 18, 10.80% from 18 to 24, 32.30% from 25 to 44, 20.60% from 45 to 64, and 9.40% who were 65 years of age or older. The median age was 32 years. For every 100 females, there were 103.60 males. For every 100 females age 18 and over, there were 101.90 males. The median household income was $44,908, and the median family income was $50,100. Males had a median income of $31,769 versus $24,550 for females. The per capita income for the county was $19,690. About 8.50% of families and 12.40% of the population were below the poverty line, including 15.20% of those under age 18 and 14.70% of those age 65 or over. As of the 2010 United States Census, there were 179,684 people, 60,691 households, and 45,275 families residing in the county. The population density was 457.5 inhabitants per square mile (176.6/km2). There were 68,825 housing units at an average density of 175.2 per square mile (67.6/km2). The racial makeup of the county was 74.1% white, 7.4% black or African American, 1.8% Asian, 0.5% American Indian, 0.1% Pacific islander, 13.9% from other races, and 2.2% from two or more races. Those of Hispanic or Latino origin made up 26.1% of the population. In terms of ancestry, 16.8% were American, 10.6% were Irish, 9.3% were English, and 8.9% were German. Of the 60,691 households, 40.2% had children under the age of 18 living with them, 56.6% were married couples living together, 12.4% had a female householder with no husband present, 25.4% were non-families, and 20.3% of all households were made up of individuals. The average household size was 2.91 and the average family size was 3.35. The median age was 34.5 years. The median income for a household in the county was $50,876 and the median income for a family was $57,774. Males had a median income of $38,671 versus $31,378 for females. The per capita income for the county was $23,675. About 11.3% of families and 14.8% of the population were below the poverty line, including 21.3% of those under age 18 and 11.6% of those age 65 or over. ^ Krakow, Kenneth K. (1975). Georgia Place-Names: Their History and Origins (PDF). Macon, GA: Winship Press. p. 101. ISBN 0-915430-00-2. ^ "Georgia Soil and Water Conservation Commission Interactive Mapping Experience". Georgia Soil and Water Conservation Commission. Retrieved November 18, 2015. ^ "Hall Area Transit Bus Services | City of Gainesville, Georgia". www.gainesville.org. Retrieved August 7, 2018. ^ "History | City of Gainesville, Georgia". www.gainesville.org. Retrieved August 7, 2018. ^ a b c "DP-1 Profile of General Population and Housing Characteristics: 2010 Demographic Profile Data". United States Census Bureau. Retrieved December 29, 2015. ^ "Population, Housing Units, Area, and Density: 2010 – County". United States Census Bureau. Retrieved December 29, 2015. ^ "DP02 SELECTED SOCIAL CHARACTERISTICS IN THE UNITED STATES – 2006–2010 American Community Survey 5-Year Estimates". United States Census Bureau. Retrieved December 29, 2015. ^ "DP03 SELECTED ECONOMIC CHARACTERISTICS – 2006–2010 American Community Survey 5-Year Estimates". United States Census Bureau. Retrieved December 29, 2015. This page was last edited on 19 March 2019, at 15:07 (UTC).